Welcome to horse country! You don't have to be a horseman or rider to enjoy all that our beautiful area has to offer (but if you are, you can't find a better place to live!). What's generally considered Virginia's horse or hunt country is the area lying roughly to the west of the suburbs/Rt. 15 to the Blue Ridge, north to the Potomac and south to Culpeper. It's characterized by rolling to hilly terrain, mountain views, horse farms and old stone walls. It's also home to more than a dozen different foxhunts--more than any other area in North America, hence the name Hunt Country. LEAVES ARE FALLING AND SO ARE PRICES...it's perfect to really see country properties and acreage--the lay of the land shows up much better at this time of year. The good news is interest rates declined recently and it's a buyer's market with plenty to choose from in all price ranges. Because there are several different counties, each with a slightly different flavor, that are considered "hunt country", you might be interested to know that the area I service includes western Loudoun, Fauquier, Rappahannock, Culpeper, as well as Clarke, Madison and parts of Western Prince William. The hunt country is basically the area from the Blue Ridge east to the outlying subdivisions in Loudoun and Prince William counties, south to Culpeper. Loudoun has the dubious distinction, achieved last year, of being the nation's fastest-growing county. Most of the rapid growth and new subdivisions are in the eastern end, but you can still find rural properties in the spectacular western end of the county around Middleburg, Philomont, Upperville and north and west of Purcellville. Fauquier is the heart of the hunt country and one of the biggest counties in the state. It stretches from the mountains near Paris (that's Virginia, not France!) at the northwestern tip, down practically to Stafford at the flatter, southern end. When someone from Alexandria, Silver Spring or McLean asks a Fauquier County resident where they live, many times they respond with the question, "Ever been to the Gold Cup?" Nearly 100,000 people from around the world visit Fauquier County each year to witness the oldest steeplechase race in the country. And even though The Virginia Gold Cup and International Gold Cup are two of our County's largest draws, they are only the beginning of the rich experiences you'll find so close to our Nations capital. Each Saturday night and Sunday afernoons on different fields throughout the county you can usually find a polo match for tailgaters, from the Saturday twilight evening series at Great Meadow to informal field play. Fun for all ages, the matches feature outstanding competition, a beautiful view of the landscape, and a chance see an old friend or find a new one. The Upperville Horse Show is one of the premier events in the world of equestrian sports, and is held year each June. It features the prestigious $100,000 Budweiser Upperville Jumper Classic along with several days of competition leading up to this world class event. You are very likely to see an Olympic hopeful, or a past Olympic medalist in the competition. 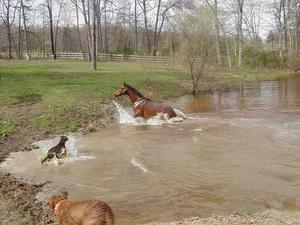 Each weekend you'll find a full calendar of horse events taking place in Fauquier County. From Fox Hunting to Steeplechase, we have it all for the equestrian enthusiast. If you come out to visit and enjoy one of these activities, be careful! You won't want to leave! Its hard to find a book about the Civil War that doesn't mention Fauquier County, Virginia. From John S Mosby to The Black Horse Cavalry, the county is rich in Civil War history and lore. The Old Jail Museum in historic Old Town Warrenton features relics from the Revolutionary and Civil Wars, and exhibits including the John S. Mosby collection. Explore the Virginiana Room at the Fauquier County Public Library. Historical documents, books and newspapers from Fauquier County and a variety of materials pertaining to the Commonwealth of Virginia and prominent Virginians can be found there. Antiques - Fresh Produce - Unusual and Interesting Stores - World Class Restaurants - Breathtaking Views. If these items pique your interest, and you're near the Washington, DC area, you simply have to come visit. The Farmers Markets in The Plains (540-253-5289) and Warrenton (540-347-1101) offer huge arrays of locally grown produce and more. The Ashby Inn & Restaurant in Paris (540-592-3900) (yep, Fauquier County), Frogs & Friends in Marshall (540-253-5399), The Rail Stop in the Plains (540-253-5644), 1763 Inn in Upperville (540-592-3848) and over 40 other privately owned restaurants can be found tucked into the small towns, rolling foothills and breathtaking venues throughout the county. And, if you're looking for something different to do for a friend or relative on his or her birthday (or any day, for that matter), visit the Flying Circus in Bealeton and take a ride in a bi-plane! Or just sit back, and enjoy the show! Wine making has a great tradition in Fauquier County, and our many vineyards offer the very standard for Virginia Wines. Naked Mountain Vineyard, The Oasis Winery, Linden Vineyards and Piedmont Vineyards and Winery are but a few of the long standing producers of quality Virginia wines from Fauquier County. If you're a wine connoisseur, you surely don't want to miss the Virginia Wineries Festival (1-800-277-CORK) held each Spring at Great Meadow. Whether you're into hiking, biking, horseback riding, camping, fishing, hunting, or bird watching, you can do it in Fauquier County. If you're looking for the fireworks of Fall, the painted sunsets of Summer, the snow covered hills of Winter, or the beautiful buds of Spring, its all here awaiting your arrival. Take a leisurely drive down Route 211, a jaunt through the winding hills of Markham, or a trek up Paris Mountain to get a glimpse of the natural beauty that gives Fauquier County that clean, preserved feel. For those stuck in the gridlock of Northern Virginia, Maryland, and DC, you'll find Fauquier County a very short drive away (probably about as quick as running to your local grocery store!). Many who visit find it hard to believe so much culture, history, expansive space, and beautiful countryside lie so close to where they live and work. Why fight the traffic at a mall? A quick drive away are uncrowded streets, unusual shops, great places to eat, and tons of fun things to do - all right here in Fauquier County, Virginia.